Adopted on June 26, 2013.. The marbled salamander, (Ambystoma opacum,) became the official state salamander of the State or North Carolina when Governor Pat McCrory signed mega-symbol House Bill No. 830 on June 26, 2013. The marbled salamander, (Ambystoma opacum,) is a species of mole salamander found in the eastern United States. 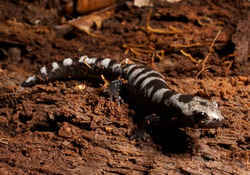 Marbled salamanders reach a length of 4 to 5 inches (10 to 12.7 cm), head and body. They have smooth, dark gray to black skin, or even deep purple above with a gray belly. Light silver to white markings are on their back. Marbled salamanders have a stocky body with a short, broad head, and a relatively short tail for a salamander - their tail is 40% of their total length. They also have short legs with four toes on their forelegs and five toes on their hind legs. The marbled salamander is three to five inches long. It has a black body with white or silvery-gray markings. The female has gray markings and the male has white markings. It has 11-12 costal grooves (vertical grooves). This salamander is found in deciduous forests of the piedmont and coastal plain. 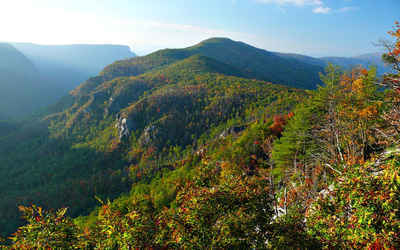 It may be abundant in floodplain forests, but also occurs in upland forests where appropriate breeding sites are found. This species is found in drier situations than are suitable for most species of Ambystoma. The aquatic larvae feed on macrozooplankton, insects, insect larvae, isopods, snails, worms, and other invertebrates. Because this salamander is often the first to hatch after the inundation of the pool, it is a major predator on other amphibian eggs and larvae. 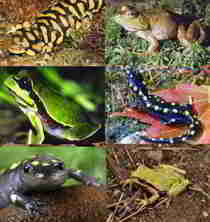 Adults feed on small invertebrates and often hunt at night. 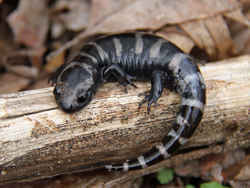 The marbled salamander breeds from September to October in the northern part of its range and from October to December in the southern part of its range. The marbled salamander mates and lays its eggs on land. The female lays 50-200 eggs, one at a time, in a depression under a log or in a clump of vegetation that will fill with water when it rains. The female usually curls her body around the eggs to keep them moist and waits for rain to fill the depression. The larvae hatch a few days after being covered by water. If there is not enough autumn and winter rain, the larvae may not hatch until spring! 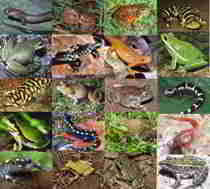 The larvae will change into salamanders in about three to six months. Except for during breeding season, marbled salamanders are solitary creatures. 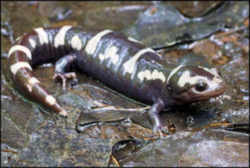 The marbled salamander became the official state salamander of the State or North Carolina when Governor Pat McCrory signed mega-symbol House Bill No. 830 on June 26, 2013. Chapter 145 State Symbols and Other Official Adoptions.